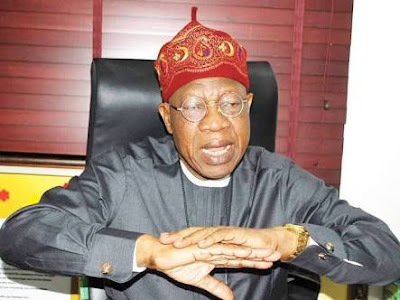 The minister of information and culture Alhaji Lai Muhammed have dissociate self from the rumour circulating about that he orchestrated the arrest of some Saraki loyalist in a press statement issue by SA to the Minister Segun Adeyemi. The attention of the Honourable Minister of Information and Culture, Alhaji Lai Mohammed, has been drawn to the accusation by the Kwara South Youths Stakeholders that he orchestrated the recent arrest by the police of some youths in the Kwara South. The Hon. Minister vehemently rejects this accusation. He has nothing to do with the arrest of the youths in Kwara South, and believes - contrary to the allegation by the stakeholders - that the arrest has nothing to do with the Ward Congress in his hometown of Oro. Afterall, suspected cultists were also recently arrested and paraded by the police in Ilorin. The Hon. Minister wishes to state that the police, in the exercise of its constitutional responsibility, does not need to be goaded by anyone to carry out arrests where necessary. Concerning the outcome of the election in his Oro Ward 2, the Hon. Minister has made his observations on the conduct of the election known to the appropriate party authorities, in line with his strong belief in the rule of law. Suffice it to say, however, that the only credible Ward election was the one held by the genuine party members in Oro Ward 2. That explains why, after the election, there was a rally around Oro Town that eventually terminated in the country home of the Hon. Minister. He does not believe there is any linkage between the election and the arrests.